*Prince Sultan Military Medical City, Riyadh, Saudi Arabia. © 2018 IJMDC. Published by Discover STM Publishing Ltd. Mental health disorder is common among working population worldwide and among health care-workers (HCWs) in particular. The prevalence of depression among HCWs varies significantly when taking in account different groups like among physician or among nursing staff or using different scales to assess depression. A cross-sectional study was conducted on 300 HCWs of King Abdul Aziz Medical City in Riyadh, Saudi Arabia, using English version of the valid patient health questionnaire-9 questionnaire. A 100% response rate was retained. The main outcome revealed that 4% of the HCWs had depression, as the initial diagnosis. Around 6.7% of them had the major depressive disorder, while 11.4% had symptoms of depression. The mean age was 28.4 (standard deviation 6.3). Depression was noted to be more prevalent during the first year of work. Socially, singles have a higher rate of depression than married. This study showed the prevalence of depression among HCWs which is quite common, but it was noted to be less prevalent when it was compared to the international studies in the same field. Further studies should be conducted to explore the magnitude and impact of mental illness among HCWs. Depression, health care-worker, mental health, stress-induced depression. At its worst, stress is common among working population worldwide and the prevalence of work-related stress among health care-workers (HCWs) was estimated in Amsterdam in 2016 that showed about 22% of HCWs had general stress, 17% had work-related fatigue, 12% were distressed, and 6% burned out . There are probably many reasons for this problem; these might change the environment, media, socioeconomic status changes, and stress at work . Depression has been known to impair job performance and productivity as found among Australian employees in 2017 that it increased employee turnover experiencing depression . In 2012, the World Health Organization reported that depression is the leading cause of disability for both males and females. However, the depression is 50% higher for females than males . Depression is one of the leading causes of mortality and morbidity worldwide, accounted for 4.4% of the global disability . In Brazil in 2014, a study reported the prevalence of depression among physicians and the way to protect them from exposure to depression and decrease it among physicians and it was suggested that by interventions and health-promoting activities for physicians and also changing their working conditions that affect mental health can be helpful . In the health sectors, the most exposed employees to high challenges were physicians and nurses. Physicians were exposed to depression due to their occupation as previous studies showed that the prevalence of depressive symptoms among physicians in China was about 28.13% . Another study was conducted in the same city among nurses and found that 38% of nurses had depressive symptoms . In Saudi Arabia, many studies focused on stress-related work and mental illness, the prevalence of depression among HCWs had been estimated in many studies. Notably, the prevalence of depression among HCWs varied significantly when taking in account different groups like among physicians or among nursing staff, or using different scales to assess depression like different age groups, times, and geographic locations but the majority of cases had mild to moderate depression . The Ministry of Health did many studies and estimated that there were high rates of depression among HCWs due to insufficient technical facilities, the absence of appreciation, long working hours, and short breaks . Al-Zahrani in 2014 reported that physicians who worked in the emergency (ER) department had a prevalence of 8% depression of different severities, 10% of them were undiagnosed, and 6% were treated with medication . There were many factors affecting HCWs that could lead to depression; one of the factors that might affect HCWs was the time of experience as it was reported by Thomas Olsen Gramstad that in the early years of career development, depression was more prevalent due to consideration of high levels of job stress . Social status was another factor that affected people, especially women, to get depression. The studies showed that women are vulnerable to poor mental health due to marriage-related issues, domestic violence; verbal or physical, stressful life, poor social conditions, and hormonal changes. Women in their perinatal period are more at risk for depression due to pregnancy-related concerns . Addressing the prevalence of depression and associated risk factors will help reduce this disorder among the working population that will improve productivity. A cross-sectional study conducted for HCWs in King Abdul Aziz Medical City (KAMC) Health Affair, Ministry of National Guard in Riyadh, Saudi Arabia over one year, from September 2015 till August 2016, using a self-administered questionnaire in English. A total of 300 questionnaires were completed and retained a response rate of 100%. The questionnaire contained 12 questions related to the demographic data, in addition to nine questions related to depression assessment. Depression is assessed using some questions from validating questionnaire used in Patient Health nine questionnaires (PH9) . The questionnaire was pre-tested on 20 subjects from the target population to check the tool clarity and accuracy, according to PH-Q-9 protocol. The data were analyzed by using IBM SPSS program, version 23. p-value equal to or lesser than 0.05 was considered statistically significant. The female participants represented 67% of the sample size including 52.7% married participants and 47.3% unmarried. The mean age of the sample was 33 years old with a standard deviation (SD) of 8.6 years with a minimum age of 22 and a maximum age of 62. The analysis of the data showed that 33% of the samples were nurses, 26% were doctors, and 43.3% were of other occupations from health care providers. The majority of the sample was working for 8 hours (68.4%), 60.3% were working in regular shifts, and 30% of the HCWs were on calls. Regarding the HCWs in the KAMC, the highest specialty reported were nurses (33%), 12% were pharmacists, and 11.3% were physiotherapists. The internal medicine specialty was found to have the highest number among other specialties as it was about 7%, surgery 3%, obstetrics and gynecology 1.7%, family medicine 3.3%, pediatrics 2.7%, radiologists 1%, dermatologists 1%, dentists 2.3%, health educators 4.3%, lab technologists 3.3%, and the occupational therapy 1.5%. The mean of years of experience was 5.6 with an SD of 4.7 years. The minimum number of the years of experience was 1 and the maximum number of the years of experience was 29 years. The main outcomes of the study sample showed that there were about 4% of the HCWs who had depression according to patient health questionnaire (PHQ)-9, about 6.7% of the participants had the major depressive disorder, and about 11.4% of the participants had symptoms of depression. The mean depressive scoring was 4.93% with an SD of 4.96 (Table 1). It was found that the initial diagnosis of depression was 5.1% in males while it was 3.5% in females. Workers who had major depressive disorder, the percentage was about 10.1% in males while 5% in females with a p-value = 0.09 which was statistically insignificant. In addition, it was found that the singles had a higher rate of initial diagnosis of depression (6.3%) while married had 1.9% which was statistically significant with a p-value 0.05. Also, singles had a higher major depressive disorder (9.9%) while married had 3.8% with a p-value of 0.03. Table 1. PHQ-9 main depression prevalence in HCWs at KAMC. Regarding initial diagnosis of depression due to the job type, it was found that the doctors reported 7%, the nurses reported 2%, and others reported 4% with a p value of 0.24. Ten percent of the doctors had major depressive disorder while in nurses it was 4% with a p value 0.3 (Figure 1). About developing depression due to working hours, it was revealed that there were about 3.4% of the participants who were working for 12 hours and had an initial diagnosis of depression. While there were 3% participants who were working for 8 hours with a p-value 0.9. There were 6.8% of the participants who had major depressive disorder and who were working for 8 hours, while 4.5% of the sample population were working for 12 hours (p-value = 0.4). Five percent of the workers who were working in mixed shifts showed initial diagnosis of depression while 3.3% were reported to have worked in regular shifts with p-value (0.4). There were 7.6% of the participants who were working in mixed shifts and who had major depressive disorder while 6.1% who were working in regular shifts with a p-value 0.6 (Table 2). HCWs who were covering on-call duties had a higher prevalence of initial diagnosis as it was found in 6.7% of the participants (p-value = 0.1). The workers who were covering on calls and had the major depressive disorder were found to be about 10% with a p-value of 0.1. One of the factors that affected depression was the nature of work, and it was found that 7.9% of the sample who had an initial diagnosis of depression were working in ER department with a p-value of 0.3 while 10.5% had major depressive disorder who were working in ER with a p-value 0.5. Figure 1. The relation between job type and prevalence of depression in HCWs in KAMC. Table 2. Relation between depression and working hours and type of shift in HCWs at KAMC. The mean of age of workers who had major depressive symptoms was 28.4 years with SD of 6.3 years and p-value (0.03) which was statistically significant. The mean years of working experience and having depressive symptoms was 4 years with an SD 4.1 and p-value (0.2) which is statistically insignificant. The relation between age and depression was (−0.2) which is negatively strongly correlated with a p-value (0.00), and the relation between depression score and the years of experience was (−0.1) which is negatively strongly related with a p-value (0.00), and it is statistically significant. In reviewing the prevalence of depression in the general population in Saudi Arabia, a recent study published in 2014 in Riyadh showed that the prevalence of depression was 49.9% . On the other hand, a study done in 2012 in the Eastern region of Saudi Arabia using patient health questionnaire PHQ-score system, the estimated prevalence of depression was about 32.8% . In this study, it was found that 4% of the HCWs had depression, 6.7% of the participants had the major depressive disorder, and 11.4% of the sample had the symptoms of depression. The mean depressive scoring was 4.9% in National Guard Health Affair, which was less than the general population. The study conducted in Al-Qassim region in KSA in the Ministry of Health hospitals in 2013 found that the nurses have moderate depression as the percentage was about 19.1% and severe depression was about 13.1% . On the other hand, an international study done in 2014 in South East Nigeria on the HCWs reported that about 14.9% of the sample had depression using different rating scales that explained the difference . The age mean of workers who had major depressive symptoms was about 28.4 years with an SD of 6.3 (p = 0.03). In the study done in Riyadh in 2013 in King Fahad Medical City, it was found that 10% of the sample in their 30s had depression . In South-East Nigeria, it was found that the depression was higher at the age of 20–29 years which was estimated to be about 41.7% . The mean of years of working experience was 4 years with an SD of 4.1 and p-value (0.2) in this study. In a study done in Al-Qassim region in KSA in 2013, it was found that 65% of the sample who had working experience of fewer than 5 years had depression . In south-East Nigeria in 2014, it was found that the prevalence of depression was higher in the first 5 years of experience as it was estimated to be 56% . In this study, it was found that the initial diagnosis of depression was about 5.1% in males, while 3.5% in females and the chi-square test was 0.51 which was statistically insignificant. HCWs who had major depressive disorder were estimated to be 10.1% in males, while 5% in females with a p-value (0.09) which was statistically insignificant in KAMC. In 2012, a research done in Riyadh in King Fahad Medical City studying depression among nursing staff and by using HIV (Human Immunodeficiency Virus) Associated Dementia-scale found that male nurses had a higher prevalence of depression about 26.5%, while females had 18.8% which is statistically significant. This is in agreement with the current study in the same region but different hospital . Regarding marital status in relation to depression among HCWs, singles had a higher rate of initial diagnosis of depression (6.3%) while married had 1.9% with p-value = 0.05, which was statistically significant. In addition, more singles had a higher major depressive disorder (9.9%) than married (3.8%) with a p-value of 0.03. This could be explained in terms of poor support for singles, no one to share their problems; a study done in Riyadh region at King Fahad Medical City (KFMC) in KSA in 2013 found a higher prevalence of depression among widows (18.2%) . HCWs usually work for 8 hours and it varies according to the specialty such as physicians, nurses, or pharmacists who work for 8 hours but in shifts while some specialty workers work only in morning shifts. It was found that 3.4% of HCWs who were working for 12 hours had the initial diagnosis of depression, while 3% of HCWs who worked for 8 hours with a p-value of 0.9. In addition, it was found that 6.8% of the participants who had major depressive disorder worked for 8 hours while 4.5% had major depressive disorder who worked for 12 hours with a p-value of 0.4. In the study done in 2013 in the Qassim region, it was found that 52% of nurses had depression, and they had been working for 8 hours . This could be related to the lack of sleep, the stress of work, or reflection of social stressors. In this current study, it was found that the HCWs who were working in mixed shifts, 5% of them had an initial diagnosis of depression while 3.3% of regular shift had an initial diagnosis of depression and 7.6% who worked in mixed shifts had major depressive disorder while it was found in 6.1% who worked in regular shifts. In KFMC, Riyadh, it was found that prevalence of depression was higher (71%) than the nurses who worked in regular shifts . In relation of depression to the nature of work, it was found that 7.9% had the initial diagnosis of depression due to their nature of work in ER department with p-value (0.3) which is statistically insignificant and 10.5% had major depressive disorder in workers of ER with p-value (0.5) which is statistically insignificant, in KAMC. In another study, which was done in Makkah Al-Mukaramah hospital to measure the prevalence of depression, it was found that about 47% of ER physicians had mild depression, the authors used the BDI scale  and a study done in Europe in 2011 also found that 28.4% of nurses who worked in ICU had depression using the same depression scale . This study concludes that depressive symptoms affect enough HCWs to warrant concern and intervention. High-stress environments are likely to lead to more health problems in workers in health care centers. Addressing the prevalence of depression and associated risk factors will help reduce this disorder among the working population that will improve productivity. It is recommended to conduct an optional annual screening of depression among HCWs and to design the working hours and the shifts schedule in a way that balances the sleep cycle and social life with work life. Written consent was obtained from all the participants. The ethical approval was taken from the King Abdullah International Medical Research Center (KAIMRC), approval number RC15/068/R, and the Department of Family Medicine research committee, at Ministry of National Guard Health Affairs, Riyadh. American Psychological Association. Stress in America: our health at risk. American Psychological Association, Washington, DC, 2012. Al Hosis KF, Mersal FA, Keshk LI. 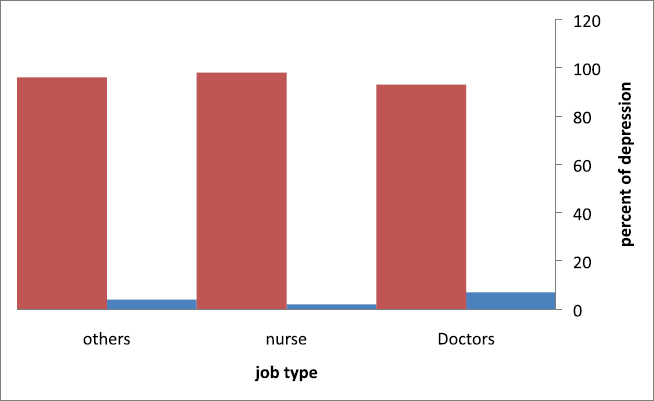 Effects of job stress on health of Saudi nurses working in Ministry of Health hospitals in Qassim region in KSA. Life Sci J 2013; 10(1):1036–44. Al-Zahrani AH, Kalo BB. Depression among emergency room physicians and its associated factors in Makkah Al-Mokarramah Hospitals -. International Journal of Medical Science and Public Health. 2014;3(12):1501–6. Abbas MAF, Abu Zaid L, Hussaein M, Bakheet KH, AlHamdan NA. Anxiety and depression among nursing staff at King Fahad Medical City, Kingdom of Saudi Arabia. J Am Sci 2012; 8(10):778–94. Kroenke K, Spitzer RL, Williams JB. The PHQ-9: validity of a brief depression severity measure. J General Intern Med 2001; 16(9):606–13. Al-Shehri SZ, Sabra AA, Taha AZ, Khamis AH, Hafez AS. Depression and anxiety among males attending primary health care centers, Eastern Saudi Arabia: prevalence and predictors. Life Sci J 2012; 9(3):1–5.